BAY VILLAGE, Ohio (April 7, 2009) -- Back for its second year, Bay Schools Bike To School Challenge sponsored by Century Cycles and Chipotle helps students in Bay Village kick the car habit by challenging them to ride their bikes to school during three weeks each spring, to improve their health, get more exercise and help the environment. It is expanded in 2009 to include Bay Middle School as well as Bay High School - a combined population of over 1,600 students. With a lot of fun and a little friendly competition between the schools, Bike To School Challenge shows students (and the community as a whole) that "going by bike" is a great way to go. Students who register for Bay Schools Bike To School Challenge sponsored by Century Cycles and Chipotle carry a redemption card that is stamped each day they ride a bike to school. The more days they ride, the more they get - including free t-shirts and bicycle accessories from Century Cycles bicycle store in Rocky River and free burritos from Chipotle. They also qualify for Bike To School Challenge's grand prizes - two Raleigh and two Giant bicycles (one each per school, courtesy of Century Cycles, Raleigh Bicycles and Giant Bicycles) and free Chipotle burritos for a year. Bay Schools Bike To Challenge starts on May 4, dubbed "Free Burrito Day" -- each student who registers for Bike To School Challenge and rides the first day receives a free burrito from Chipotle. It concludes on May 22 with a pancake breakfast prepared for participating students by teachers and staff, plus assemblies at each school to show the students the impact of their efforts and draw the grand prize winners' names. NEW IN 2009: The Golden Sprocket Award: The Golden Sprocket Award is the brainchild of BHS Assistant Principal Jason Martin and BMS Principal Sean McAndrews (and the trophy itself is the creation of the mechanics at Century Cycles). Bay Middle School and Bay High School will be competing during Bike To School Challenge to see which school has the greatest percentage of bike-riders on the three Wednesdays of the program, with the winner receiving the Golden Sprocket Award. It will be awarded weekly during Bike To School Challenge, on May 6, May 13 and May 20. The award will be displayed in the main office of the winning school building for as long as the school holds the title. On Friday, May 22, the Golden Sprocket will be awarded to the school with the greatest average percentage from the three dates, which will then be the permanent home of the award until the 2010 Bike To School Challenge. In order to be eligible for the Golden Sprocket Award, a building principal or assistant principal at each school must have ridden a bicycle to school on the date of the challenge. Support from around the community: In addition to the Golden Sprocket Award and the prizes provided by Century Cycles and Chipotle, the program is receiving support from the community to encourage students to ride their bikes to school. The Parent Teacher Student Association at Bay Middle School and the Parent Teacher Association at Bay High School will provide free water bottles to the students as a prize. Friday, May 15, is Free Caribou Drink Day. Every student who rides that day receives a free drink voucher from Caribou Coffee. On Tuesday, May 19, Mitchell's Ice Cream will give free ice cream cones to 20 lucky students, randomly drawn from those who ride that day. On Friday, May 8, Studio VANITYLAB will give free haircuts to 25 Bay High School students, randomly drawn from those who ride that day. 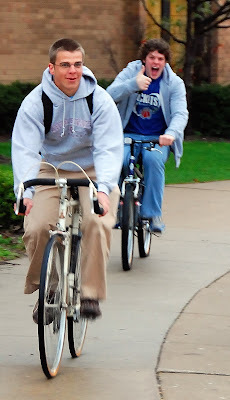 Success in 2008: Launched in 2008 as "Bay High School Bike To School Month sponsored by Century Cycles," the program was inspired by a student car boycott in 2007, when Century Cycles owner Scott Cowan approached his alma mater about encouraging more bike-riding to school. It was enthusiastically embraced by the students and faculty. Participation exceeded organizers' expectations - 543 students (66 percent of the school) registered for the program and on average 224 students per day biked to school during an unusually cold and rainy May. At its conclusion, Bay High School students rode an estimated 15,566 miles, saved $2,883 in fuel costs, and reduced carbon emissions by 14,350 pounds. Students said they rode their bikes more even after the program ended and the BHS faculty organized their own team for the MS 150, an annual 150-mile bicycle ride. Okay... if I ride to work, can I get a card stamped? I LOVE Chipotle!! ;) I am so jealous!! All I get for riding to work is the admiration and stunned awe of my coworkers. I want Chipotle! !